The Young and the Restless (Y&R) spoilers for Tuesday, August 8, tease that Jack (Peter Bergman) and Phyllis (Gina Tognoni) will realize they’ve formed a bit of a partnership. Phyllis pushed Ben Hochman (Ben Hermes) in Victoria’s (Amelia Heinle) direction and they ended up spending the night together. Jack will take advantage of Victoria’s recklessness, so he’ll appreciate Phyllis’ efforts. They’ll debate what they’re doing and determine that it’s best to keep their “little joint venture” under wraps. Of course, it’s doubtful they’ll be able to keep this a secret indefinitely. When Billy (Jason Thompson) finds out Phyllis played games with Victoria’s life, he won’t be pleased. Billy should be even angrier when he learns Phyllis teamed up with Jack behind his back. For now, Billy will just be confused about Victoria’s side of the story. After flowers arrive for Victoria on Monday, Billy will get suspicious. He’ll hint that her evening must’ve involved more than just dinner. 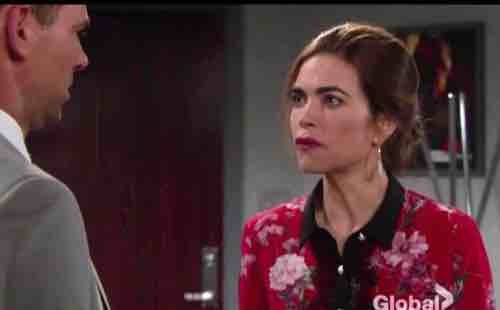 The Young and the Restless spoilers say Victoria will explode at Billy in Tuesday’s Y&R episode. She’ll object to this interrogation about a very private matter. Billy will contend that he’s just worried about her behavior as well as the fate of the company. Mixing business with pleasure is the last thing they need to be doing right now. They can’t risk more bad press since they had to settle a sexual harassment lawsuit. Nevertheless, Victoria will maintain that it’s none of Billy’s business. She’ll point out that she doesn’t grill him about his love making sessions with Phyllis. It sounds like some old feelings will be a factor in this fight. Jealousy could be in play for both of them. Other Young and the Restless spoilers say Ashley (Eileen Davidson) will need something from Neil (Kristoff St. John). She recently had a chat with Dina (Marla Adams) and it put her on a new mission. Ashley feels like Dina is depressed about giving up Mergeron Enterprises. It’s been hard for her to take a step back from work. Neil will suggest that he’d like to learn the mysterious reason for Ashley’s visit. She’ll probably hope that Neil can find a position for Dina to fill. She’ll think it’d be good for her mother to feel useful again. Neil will likely come through for Ash, but that may not solve the problem. Dina seems to be battling something more than depression. Will Ashley discover that something else is going on? The truth has to come out sooner or later. We’ll give you updates as other Y&R news comes in. Stay tuned to the CBS soap and don’t forget to check CDL often for the latest Young and the Restless spoilers, updates and news. Sign up for our newsletter by clicking here and get the latest breaking soap news!